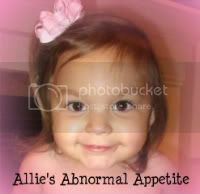 Allie had a GI follow-up yesterday. It's been a while since she seen Dr. Brown so I figured this would be an interesting appointment. I always get a bit sad going to these appointments because it's never "great" news. It's not bad news, but not great either. 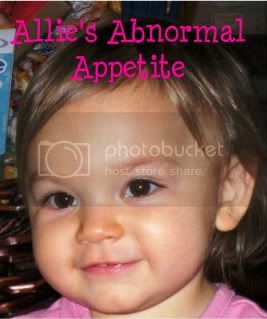 Allie's weight was 27.4 pounds and her height was 37 inches. Allie's weight has increased about a half a pound since May and her height barely increased. She had a weight gain so it's not bad news but since the weight gain was very minimal in the last 5 months, it's not "great" news either. Dr. Brown believes that Allie has become tachphylactic (immune) to her Ranitidine medication so he's putting her on Nizatidine. This should help reduce stomach acid - which could be slowing her stomach digestion down and contributing to her delayed emptying. She is also on Erythromycin but she may be immune to that also so they could switch her to Cyproheptadine in the near future. The Erythromycin is used to help stimulate her stomach muscles in hopes that the stomach processes food faster. In all honestly, it doesn't seem like the medication is doing much of anything, however what else do we have to try? Gastroparesis is not fixable it's only treatable by medication. There is only 1 medication that we haven't tried, Reglan and I refuse to try it on Allie. Allie continues to only handle 3 oz of food at a time. Her oral intake remains about the same and it continues to be sporadic. I hate to complain because she is at least eating orally a little bit and that is what we ultimately hope for. It's just very frustrating that her tiny little tummy can only handle 3 oz of food or she throws up. With her stomach only being able to handle such a small amount plus her delayed emptying, we are continuing to struggle getting enough food into her. We have decided to try the Duocal again - this will add calories to her blends. I'm not wild about it because it's "empty" calories for her but nothing less, they are calories and she needs them. Allie is really enjoying Preschool and she is getting more brave at leaving me. She doesn't cry when I bring her to school anymore. It really helps that some of her great friends are in her class - that is such a blessing. Allie is growing up quickly and her personality is showing it. She's becoming such a big girl now and is enjoying being a little bit more independent on some things. She still needs mom for most things - even getting her dressed. However, I don't mind, she's my little peanut! Here are a couple pictures of the girls playing in the rain.